(07/04/2017-08:09:00 AM) Representatives from the Trade Office of the Vietnamese Embassy in Argentina had a working session with leaders of the Coto Group to explore opportunities for Vietnamese products to penetrate into the South America country’s leading super-market chain. 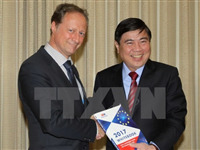 (15/03/2017-14:58:00 PM) The European Union (EU) wants to become the largest investor in Vietnam, especially in Ho Chi Minh City and neighbouring localities, said Ambassador Bruno Angelet, head of the EU Delegation to Vietnam during a meeting in the southern city on March 15 with Chairman of the municipal People’s Committee Nguyen Thanh Phong. (01/01/2016-14:39:00 PM) (MPI Portal) – On December 11th 2015, in Pakse city under Champasak province, People’s Democratic Republic of Laos, the 10th Cambodia – Laos – Vietnam (CLV) development triangle area joint coordination committee meeting was held under the co-chairing of H.E. Somdy Duangdy, Minister of Planning and Investment of PDR Laos, Chairman of Coordination Committee on the Development Triangle Area in Laos, H.E. Sun Chanthol, Senior Minister of Commerce of Kingdom of Cambodia, Chairman of Coordination Committee on the Development Triangle Area in Cambodia, H.E. Bui Quang Vinh, Minister of Planning and Investment of Socialist Republic of Vietnam, Chairman of Coordination Committee on the Development Triangle Area in Vietnam. (01/12/2015-16:16:00 PM) The President of the Republic of Korea (RoK) welcomed the parliament’s ratification of free trade agreements (FTAs) with Vietnam, China and New Zealand on November 30, the Presidential office said in a statement released the same day. (16/04/2014-15:32:00 PM) (MPI Portal) – In the afternoon on April 15th, at the headquarters of the Ministry of Planning and Investment, Minister Bui Quang Vinh had a meeting with Asia Development Bank (ADB) Country Director in Vietnam, Mr. Tomoyuki Kimura to discuss Development Partnership Forum of Triangle region of Cambodia – Laos – Vietnam (CLV).